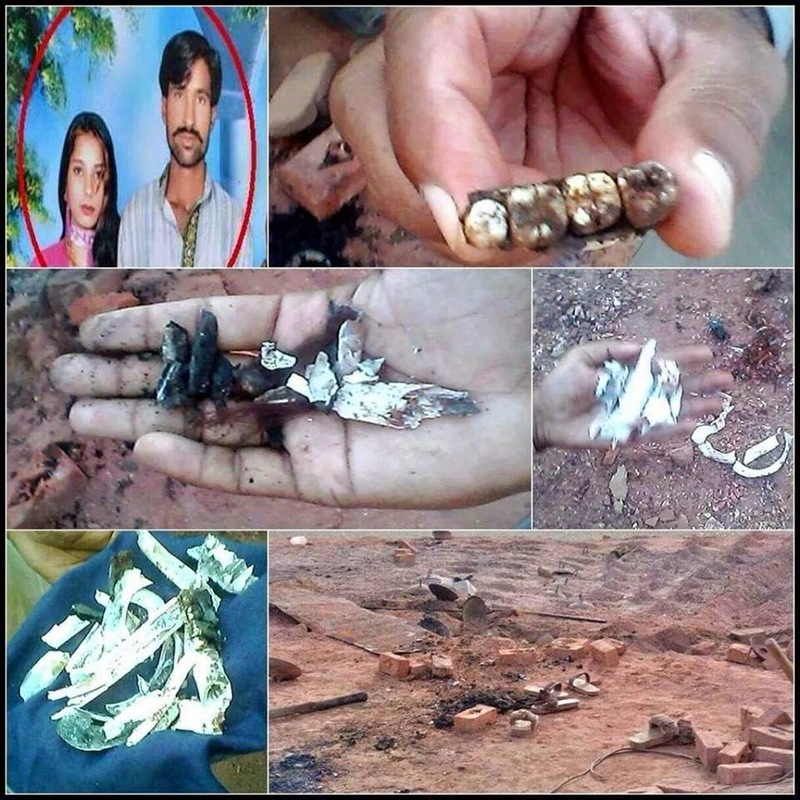 "On Sunday, Shama burned them all and threw the ashes on a garbage heap outside their quarters. Shama never meant any disrespect to Islam as she was totally illiterate and had no idea what the amulets contained," she said. 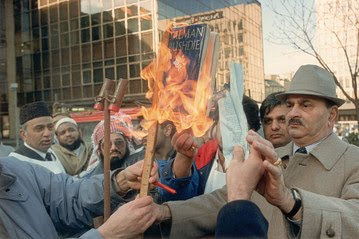 "A few people recognized partially burned pages in the ash and raised a cry that Shama had burned the Qur’an." 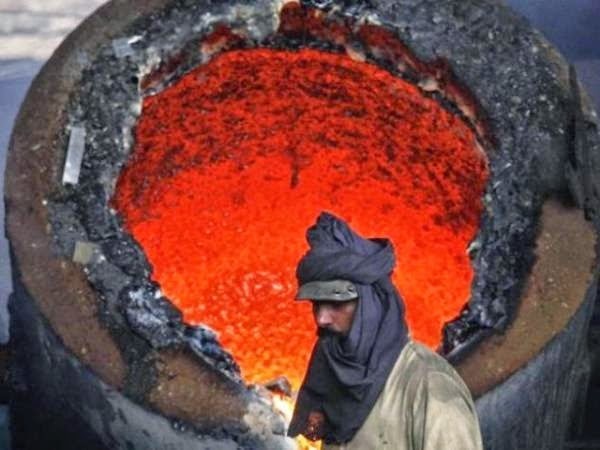 Shahzad Masih and his five brothers worked for many years at the brick kiln, owned by Yousuf Gujjar. Parveen said Shahzad and his brothers went to Gujjar to resolve the matter after the situation got tense in the village. "Gujjar on the one hand assured us that nothing would happen, and on the other hand asked his accountant not to let Shahzad and Shama flee the village without paying back their bond money", (taken from them as an ‘advance’ against their employment and wages). By Monday night, some Muslim neighbors had informed the police of the alleged desecration and warned of a possible attack on the Christian couple, Parveen said. 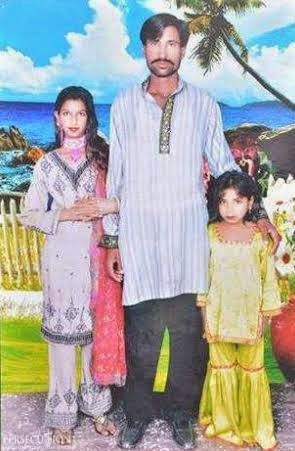 "That night I had Shahzad and Shama sleep in my home so that if the police arrested them, at least we would know. "At about 6 a.m. when Shahzad and Shama went back to their own home in order to prepare for work, an angry mob began pouring into their quarters. Sensing the danger all the Christians fled except Shama’s sister Yasmeen (married to Shahzad’s brother Fiaz Masih).Yasmeen said they were still preparing breakfast when a few more people knocked at their door and enquired about Shama. "They entered the house and one of the men dragged Shama out. Shama had their youngest daughter Poonam in her arms. That man snatched Poonam and threw her on the floor…So brick kiln guard Muhammad Akram rescued Shama and took her to the kiln office (only a few yards away from their house) and locked her in there, to save her from the attackers." "By then, the number of mobsters was very small, but we could hear announcements being made from mosque loudspeakers in nearby villages - that a Christian woman had desecrated the Qur’an".Yasmeen said people from five surrounding villages – Chak 60, Rosey, Pailan, Nawan Pindi and Hatnian – were gathered together by the residents of Chak 59 and their brick kiln coworkers." Soon thousands of men armed with clubs, hatchets and axes loaded onto tractors and trolleys began pouring in. (The guard) Akram had locked the main kiln office door from the outside, but the angry protestors broke in anyway. But they failed to break the iron door of the office inside, and Shama and Shahzad must have locked it from inside. "The angry protestors then climbed on to the roof, and broke it in, "as if it was made of wood, straw and mud" said Yasmeen.She says these men then opened the door from inside and brought the couple into the open, where the highly-charged protestors were ready to attack. "They beat them with wooden clubs on their heads, and hatchets, before they were both tied to a tractor and pulled out onto a road which was under construction, covered with crushed stones. ""I think they were unconscious, but still breathing, but the mob was still not willing to leave them alone," said Yasmeen. 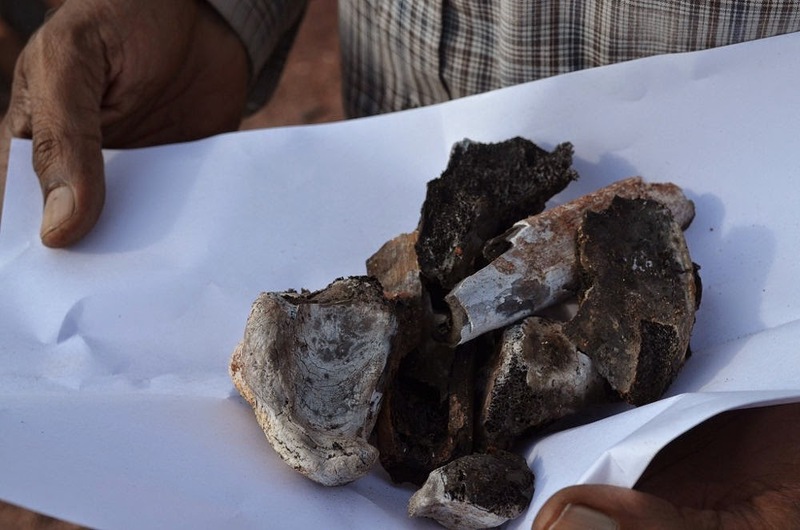 "They took some petrol from a tractor and doused their bodies and threw them in the kiln. Then I lost hope and fled with my children from there." 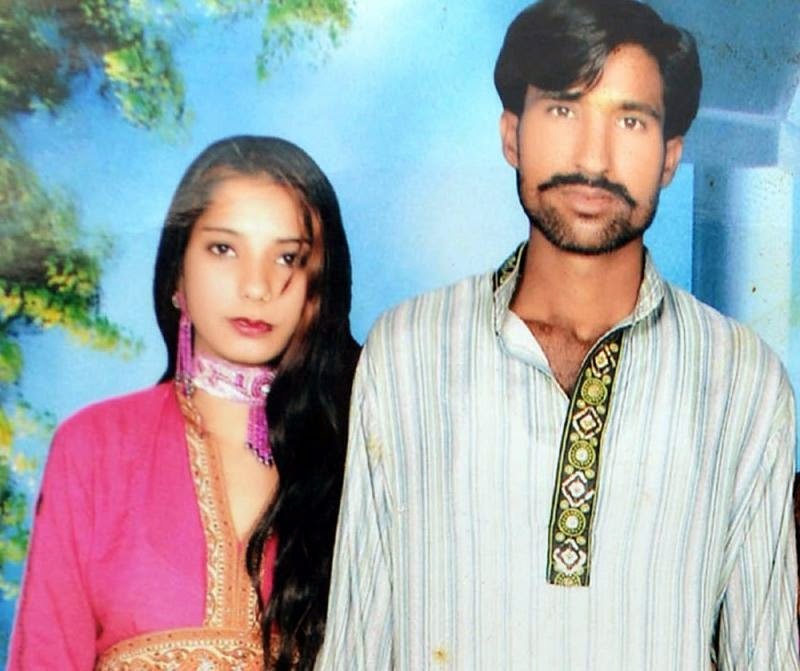 Another relative, Parvaiz Shehzad, who also lives in Clarkabad, said that Muslims of neighboring villages "were very much jealous of Christians". The village is named after Robert Clark (1825–1900), the first Anglican missionary to Pakistan. Parvaiz Shehzad said it was the first village in the district that had electricity, a bank, a post office and a high school. 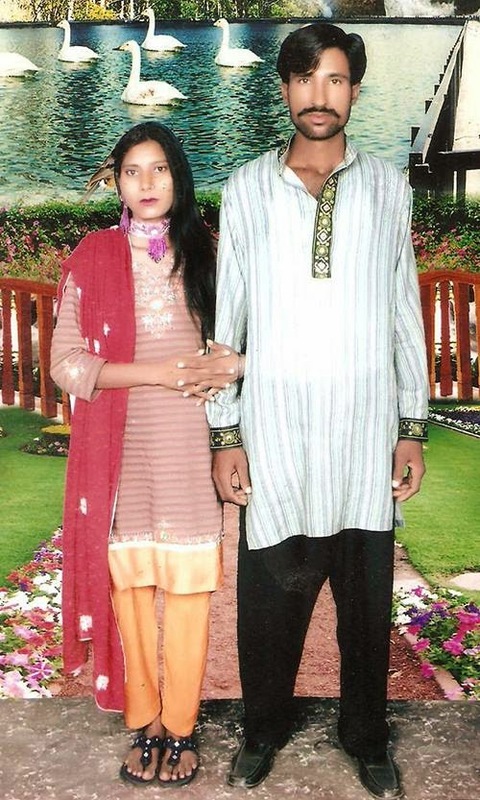 "Most educated people of surrounding villages had studied in in Clarkabad…Strife between the Christian villagers and Muslim villagers has been a common feature in recent years".As Shehzad and Shama were of Clarkabad, he claims jealousy came into play. The dead woman’s sister Yasmeen says that during the entire violent attack, a police van was present, but because they were so few, the police did not take charge. "Some men asked them to fire into the air to quell the protestors, because the mob had no weapons to fire back…Shama and her husband might have survived if the police had taken timely action." Yes, many thousands were killed in equally gruesome ways in 1947, in 1971, in 1984, in 2002; India, as Naipaul said, is a wounded civilization. But just look at these pictures...the contrast between the idyllic scenes depicted in the photographer's backgrounds and the actual life of the poor couple was already harsh when they took went to the photographer in Clarkabad; the contrast between these beautiful, hopeful faces and their terrified, screaming last hour on earth is unbearable and unimaginable. Too painful for words. After such knowledge, what forgiveness? A blasphemy law was part of the 19th century Indian Penal code as section 295 (this fact has allowed many a postmarxist to begin any discussion of blasphemy laws with the phrase "colonial era law", God be praised). These predictions may appear pessimistic and discouraging, but I would submit that they are not meant to be discouraging; they are meant to be realistic. The law will not be repealed because the law is not just an invention imposed by General Zia on an unwilling populace. Rather, this law is the updated expression of a pre-existing social and religious order. Blasphemy and apostasy laws were meant to protect the orthodox Islamic theological consensus of the 12th century AD and they have done so with remarkable effectiveness. Unlike their Christian counterparts (and prosecutions for heresy and blasphemy were seen throughout the middle ages in Europe) these laws retain their societal sanction and have been enforced by free lancers and volunteers where the state has hesitated. The most famous, and in many ways, the most telling example of the wide societal sanction for killing blasphemers is the case of the carpenters apprentice Ghazi Ilm Deen Shaheed, who executed the Hindu publisher of Rangila Rasul after legal prosecution had failed. The demand to kill Rajpal was being made openly in public meetings and two other Muslims had already attempted to kill Rajpal prior to Ilm Deen's successful attempt. In fact Ilm Deen's best friend had wanted to do the act and only stepped aside because they drew lots and Ilm Deen won thrice in a row. And when he did do the deed the Muslim community mobilized to defend him and in the high court his appeal was handled by two lawyers, one of whom was none other than Quaid E Azam Mohammed Ali Jinnah, who was asked to take up the case by that illustrious modernist and "moderate Muslim hope", Allama Mohammed Iqbal. After he was hanged by the British, Allama Iqbal was one of the leaders of a campaign to have his body brought to Lahore for reburial (he had been quietly buried in a remote prison by the British authorities). When this demand was conceded in the face of massive public protests, his funeral drew thousands and was attended with pride by Allama Iqbal, who supposedly said that “this carpenter has left us, educated people, far behind”. In an ironic twist the charpoy (rope bed) on which Ilm Deen was borne to his grave was said to have been donated by another literary luminary, Mr MD Taseer, whose own son would later become governor of Punjab and would be killed for "blasphemy" by a new Ilm Deen. Ilm Deen's grave is now a popular shrine and a movie has been made about his exploit, complete with a dance sequence featuring the blasphemer enjoying himself before he meets his fate. Rushdie went underground and has managed to survive, though some of his translators were not so lucky. But Theo Van Gogh was killed in broad daylight in Amsterdam and Ayan Hirsi Ali was driven underground for producing a supposedly blasphemous movie in liberal Holland. Another blasphemy execution was attempted by textile engineering student Aamir Cheema in Germany. And as expected, Aamir Cheema too has achieved sainthood in Pakistan after he took his own life in a German prison, with his funeral attracting thousands and his grave becoming a popular shrine. A minister in Musharraf's enlightened cabinet wrote more than one op-ed commending such acts and fantasizing about the day Salman Rushdie's skin will be torn from his body with sharp hooks. A fantastically surreal movie has even been made about the execution of Rushdie by Muslim Guerillas who penetrate his secret Zionist hideout and attack him with flying Korans. Post Script: It is likely that in the coming days some of the details of the murder will be revised (though the beating and burning are not in doubt and will not be wished away). About such revisions, it is important to keep in mind that a number of new stories are going to be circulated by interested parties to muddy the waters, spoil the prosecution, confuse the issue and so on. And the "best supported" new stories may not be the most authentic. As Goldhizer noted about hadith authentication, in many cases the best authenticated are the ones most likely to be untrue (the authentication chains being so good precisely because they were invented to look authentic). Local MPA's will be activated to defend the kiln owners. Local villagers will find ways to play down their own barbarity and play up the "desecration". Clerics will find NGO's behind a new conspiracy to defame Islam. PPS: The All Pakistan Private Schools Association (which may or may not represent too many schools) has observed an "anti-malala day" to condemn her membership in the "Rushdie club". Mashallah.